This book would have worked far better in the third person, since Stracher’s attempt at a first person narration ultimately fails—he tells us what happens to Vera, but we never feel it. The distance between character and plot would be lessened if he’d taken the third person route. In addition to this is the fact that Vera has no character arc; she does not learn from her experiences in the novel and by the end hasn’t changed at all. This cycle ride took place at a crucial time in the story – there were high stakes for the characters to get to their destination on time. But because the episode is reported like this, the tension is lessened and the impact of the kids’ journey is wasted. There are some fun cyberpunk elements with techie references such as ‘YouToo’, ‘wi-texts’ and ‘holocasts’—nice variations on communication methods we have now, that help immerse the reader in the world of the story. Unfortunately, there were also references that took me out of the story, such as when he refers to some girls in Vera’s class using nail polish; as a water-based product, I didn’t understand how it would be freely available. Vera’s obsession with Kai is sensitively portrayed. As a character, she doesn’t lose herself in her infatuation, unlike characters in more mainstream novels, most notably Bella Swan in Twilight. She never merges with him. The crux of this novel is that the drought that is making life so hard is not down to lack of water but lack of access to water due to political greed. In a world where enough food is produced but so many people in the developing world go hungry, this is an interesting and noble premise. However, this theme gets muddled in the book. There are so many opponents—Bluewater, pirates, PELA, the government—that it’s hard to know who is the root cause of the problem. I feel the book would have been stronger if it had just focused on one or at most two conspirators. But to really pull off the potential of this book, Stracher would have had to narrow the distance between the characters and reader. This book tries to make many interesting points, which make the reader stop and think—but we don’t feel them. 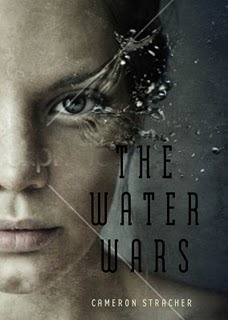 The Water Wars is a considered book and at times a compelling read. Just don’t mistake it for a YA novel.